Our Sire Dillion and Dam Lady Mona happy to announce their new litter 3 male and 2 female puppies born on Dec 29, 2018 . The puppies are ready go to their new home. ​​The puppy had their tail docked and dewclaw removed, been to Vet had their physical health check, up to date on vaccinations and de-worming. Potty train on pee pad and pre-spoiled. Miko is a charming, outgoing and adventurous little boy, seeking out new experiences every chance he gets. This handsome baby is on his way to becoming a mighty dog, just like his parents. Never have a dull moment with this guy. His personality is seeming to be playful and his affectionate nature is contagious. Miko will arrive to you with up to date on his vaccinations, along with a health physical check by Vet. Make Miko be yours today, so you can join him on his next adventure. Maverick is a darling little boy. He is stunning has the most precious adorable teddy bear face you will fall in love with. His disposition, distinct marking colors, gorgeous coat, beautiful sparkling eyes and cute little button nose make him draws attention wherever he goes. He loves to play with his litter mates and his toys. He has wonderful temperament, affection and passionate personality. Maverick will arrive to his new home happy, healthy, pre-spoiled and ready to play. He will be up to date on his vaccinations and physical health checked by his Vet. Don't miss out on this great puppy. Maverick can't wait to come home to his new family! ​Estimate his full grown weight approx. 3 to 3 1/2 lbs. ​Merlin is a darling boy! He has sweet, passionate and mellow personality. He is gentle and loves to be held and cuddling . He loves to play, but is happiest just being with you. Merlin will arrive to his new home happy, healthy, and ready to play. He will be up to date on his vaccinations and physical health check by his vet. He can't wait to be by your side as your lifelong companion. Merlin will make a wonderful little addition to your family if you are willing to spoil him with love and attention. Miley is a gem, she is so precious with the most sweet personality. She is stunning and lovable girl. Miley is the smallest in the litter but she full of energy when time to play. She stands tall with her sibling and demands that she is the center of attention too. Miley has darling precious heart and huge package of personality. She has cute little face with her irresistible big beautiful eyes and little pinkish button nose that makes your heart melt. Miley is very tiny, petite and not a toy so she is not suitable for family with young kids or huge aggressive pet that she may get injury accidentally. Miley will arrive to her new home with up to date on vaccinations, health checked by Vet, pre-spoiled and ready to love you! Don't miss out on this sweetie pie! Estimate her full grown weight approx. 2 to 3 lbs. This beautiful little girl is Maisy. She is the sweetest and loving little girl you could ask for. She loves to snuggle and play with her sibling or go exploring around her. She has a combination of gorgeous looks and great affection personality you will adore her. She will have physical health check by Vet, up to date vaccinations and arrive happy, healthy and pre-spoiled. If you are looking for a little girl to spoiled or for a life companion then here she is. Maisy is waiting for you to reserve her now one look in her eyes and you will see she is the one. Occasionly we have Adult Yorkie for Sale as companion pet. 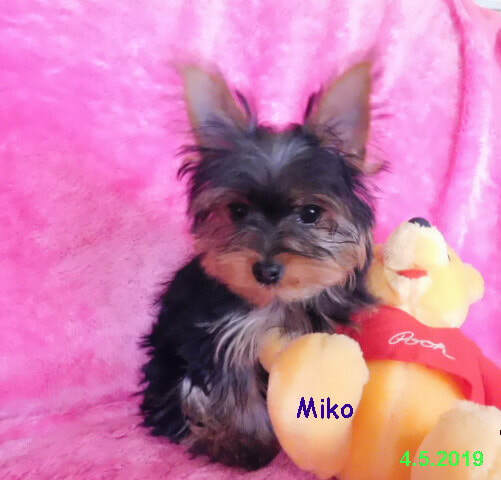 If you interest on Adult Yorkie, please visit " Adult Yorkie For Sale " page for availability.